Capture brilliant photos and 4K UHD video of coral, parrot fish, and pygmy seahorses with your Sony Alpha a7R II or a7S II mirrorless camera in Aquatica's A7r II Underwater Housing. It features a depth rating of 295', which is upgradeable to 426' for free upon request. An Ikelite manual connector enables the attachment of an optional external strobe via sync cord. The standard, coated eyepiece offers a full view of the camera's viewfinder. 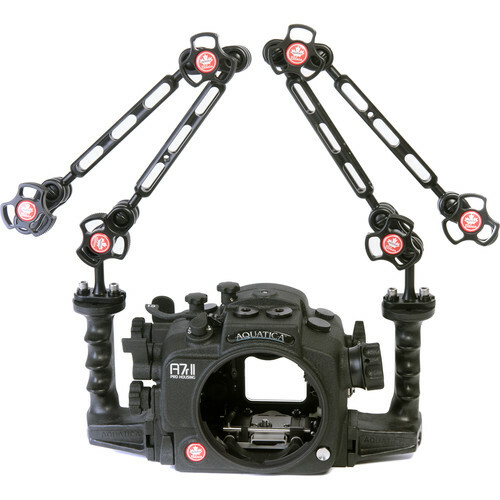 The housing provides access to virtually all camera functions via mechanical controls. It also has an ergonomic design with 2 grips that offer improved handling and attachment points for the 2 included Delta 3 #77514 lighting arms. Built for durability, especially resistance to corrosion, the housing is constructed from anodized, machined aluminum and stainless steel.